This recipe is made using classic Malaysian ingredients - chicken, lemongrass, ginger - and tastes just as good as the street-food mamak version, but is easy to make. Make Marinade: Place lemongrass, onion, garlic, ginger, fish sauce, turmeric, sugar, sesame oil, salt and pepper in a food processor. Process until smooth, adding a little water if needed (see note). 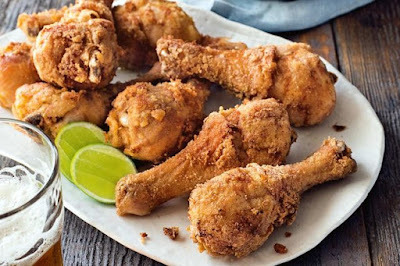 Place drumsticks in a large bowl. Add the marinade. Toss to coat. Cover. Refrigerate overnight to allow flavours to develop. Make Lime herb rice: Combine rice, mint, coriander, chilli, lime juice and grapeseed oil in a bowl. Season with salt and pepper. Drain drumsticks, discarding marinade. Place drumsticks in a bowl. Sprinkle with the salt. Add rice flour. Toss to combine. Pour enough vegetable oil into a large saucepan or wok to come 5cm up the side. Heat over medium-high heat (oil should reach 165ºC). Deep-fry drumsticks, in batches, turning, for 12 minutes or until deep golden brown and cooked through. Transfer to paper towel to drain. Serve chicken with rice and lime wedges. You can also use a mortar and pestle.